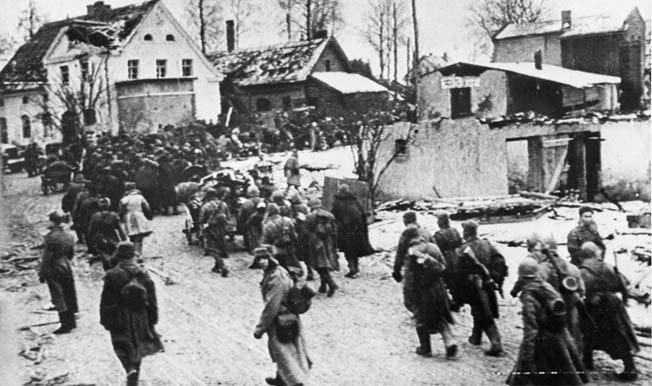 The initial Red Army offensive into East Prussia set the stage for the crushing advance that followed in early 1945. Soviet General Ivan Danilovich Cherniakhovskii was in a good mood as he waited for his generals to arrive. Born in July 1906, in the city of Uman, Cherniakhovskii joined the Red Army in 1924. In 1936 he attended the Red Army’s Academy for Motorization and Mechanization, eventually commanding the 28th Tank Division in March 1941. With the outbreak of the war, his career skyrocketed, not because of political connections but through his actions. From December 1941 to June 1942, he commanded the 241st Rifle Division, formed from his disbanded tank division. Promoted to major general in May 1942, he was given command of the 18th Tank Corps for a month before he moved up to command the 60th Army. His troops recaptured Voronezh in January 1943, and promotion to lieutenant general followed in February. The 60th Army then took part in the Battle of Kursk and the subsequent Dnepr and Kiev offensives. Promoted to colonel general in March 1944, Cherniakhovskii became the commander of the Western Front, making him the youngest front commander in the Red Army at age 38. He retained command of the front when it was renamed the 3rd Belorussian and was promoted to general of the army on June 26, having received the Hero of the Soviet Union designation twice. During the Soviet summer offensive of 1944, Cherniakhovskii smashed through the lines of the German 3rd Panzer and 4th Armies, taking Minsk and pushing on to Vilnius, Lithuania. By the end of August, the 3rd Belorussian Front had crossed the Nieman River and taken Kaunas before moving farther west. In September, Cherniakhovskii’s troops stopped to regroup and resupply. They had achieved great victories, but replacements were also needed before they could continue their advance. It had been a good run for the general. His men had helped liberate Belorussia while inflicting heavy losses on the enemy. Now, in the early days of October, the 3rd Belorussian Front stood on the border of East Prussia—the first province of Germany proper to be threatened by the Red Army. Some of his advance units had already crossed the border in small probing actions. The Russians regarded East Prussia as the seat of German militarism. Many of the Wehrmacht’s top commanders came from the area, which had produced highly trained soldiers for centuries. It was from East Prussia that the Teutonic Knights launched forays into Poland and the Baltic regions in the 13th and 14th centuries. During World War I, the Russian Army invaded the province and had suffered decisive defeats in the 1914 Battle of Tannenburg and the 2nd Battle of the Masurian Lakes in 1915. Driving the czar’s army back, German forces then moved into Russia. Detached from the rest of Germany by the Treaty of Versailles, East Prussia was reconnected with the Third Reich after the defeat of Poland. 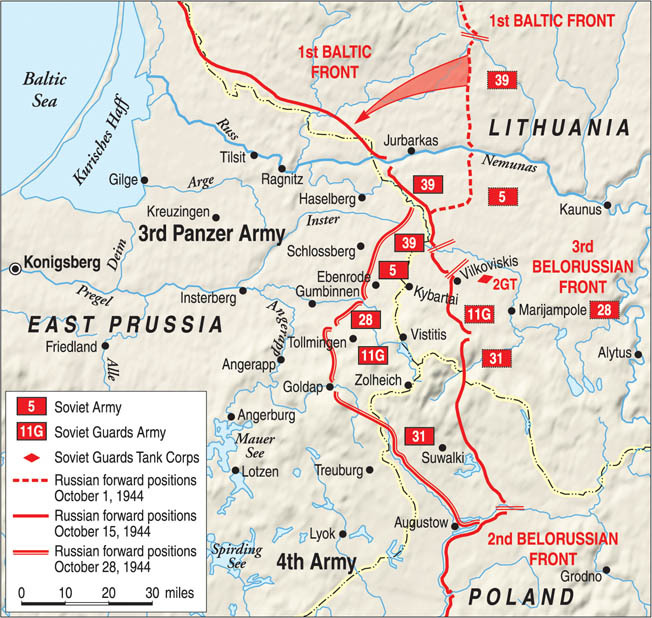 During the opening days of the invasion of the Soviet Union in 1941, East Prussia served as the jumping off point for Army Group North’s drive to Leningrad. Now, Army Group North was bottled up in the Baltic States and Cherniakhovskii had received orders from Stavka (the Soviet high command) to continue his advance. It was time to enter the lair of the German beast. As his commanders filed into a crucial meeting, Cherniakhovskii greeted each one before directing them to the map table. The maps showed a somewhat detailed area of the East Prussian border and the interior of the province. Stavka’s orders were rather ambiguous. Given his successes against the German defenses in the Baltic States, it seemed that it might be possible for Cherniakhovskii to drive his forces straight through the German lines to the province’s capital of Königsberg. However, Soviet aerial reconnaissance showed that the Germans had prepared a series of defensive lines and strongpoints to prevent such a move. Once the initial breakthrough occurred, Cherniakhovskii could weigh his options as the battle developed. If the German defenses collapsed quickly, the possibility of a quick drive to Königsberg was still in the cards. If not, the 3rd Belorussian Front could penetrate as far as possible and dig in to await support from its neighboring fronts. Cherniakovskii could also swing his armies north to the Baltic Sea, cutting off several German divisions defending positions along the coast. Whatever the initial outcome, the Soviet general planned to have his front inside East Prussia and not be kicked out. Pointing out these possibilities, Cherniakovskii unfolded his plan of attack, which would become known as the Goldap Operation. His finger moved from the Soviet frontline positions through the initial German defenses to the town of Gumbinnen. From there, he followed the Gumbinnen-Insterberg-Königsburg highway to the East Prussian capital. That would be his main axis of attack. Colonel General Kuzma Nikitovich Galitskii’s 11th Guards Army, composed of nine rifle divisions and an armored regiment, would hit the Germans in an area around Edytkau, about 40 kilometers west of Gumbinnen. To his left, the 31st Army (seven rifle divisions) under Col. Gen. Vasilii Vasilevich Glagolev, was to advance on the Rominte Heath to the town of Goldap. On the 11th Guards’ right, Lt. Gen. Ivan Illich Luidnikov’s 39th Army (eight rifle divisions, an armored brigade and regiment, and an assault gun regiment) would breach German lines around Schirwindt, located about 55 kilometers northeast of Gumbinnen, and head for Schlossberg. He would be supported by Lt. Gen. Aleksandr Aleksandrovich Luchinskii’s 28th Army (nine rifle divisions, an armored brigade, two armored regiments, and two assault gun regiments). Colonel General Nikolai Ivanovich Krylov’s 5th Army (eight rifle divisions and an armored brigade and regiment) would be held in reserve to exploit any breaches in the German line. In addition, the 3rd Belorussian Front had Maj. Gen. Aleksii Semenovich Burdeinei’s 2nd Guards Tank Corps (three armored brigades and a mechanized brigade), which would operate as an independent formation. Once the initial objectives were taken, Cherniakhovskii could decide how he wanted the assault to progress. Facing Cherniakovskii were the battered divisions of General Friedrich Hossbach’s Fourth Army. Since retreating into East Prussia, these troops had been busy repairing long neglected defenses. Hitler’s propensity for holding captured territory contributed to the neglect since he thought preparing defenses too far behind the front would lead to unauthorized withdrawals. However, East Prussia was now the front, and the men worked feverishly to improve positions that might stop the Russians. Red Army soldiers manhandle an artillery piece into position while comrades scramble forward across the sandy landscape near the East Prussian town of Tilsit on the Baltic Sea in October 1944. Soviet aircraft strike targets of opportunity in the distance. According to Cherniakhovskii’s plan, the main weight of the attack would fall on General Gerhard Matzky’s XXIV Army Corps and General Hermann Preiss’s XXVII Army Corps. Both men had served as general staff officers in Berlin before commanding forces on the Eastern Front, and both had received the Knight’s Cross as divisional commander. In early October, Matzky’s corps consisted of two infantry divisions, the 1st and the 56th. The 56th, commanded by Brig. Gen. Edmund Blaurock, was newly reformed after being decimated during the Soviet summer offensive. Brig. Gen. Hans Schittnig’s 1st Infantry Division was Matzky’s ace in the hole. The veteran division was largely made up of men from East Prussia and had garrisoned Königsberg, Insterburg, and other East Prussian cities before the war. During the coming battle they would not only be fighting for the Reich but for the homes of their friends and families. Preiss’s corps was a different case. Although he controlled four divisions, three of them (the 549th, 561st, and 547th) were Volksgrenadier divisions that had been raised in July. The Volksgrenadier division (VGD) was a formation created out of necessity. It had only six battalions compared to the normal nine and had a higher proportion of automatic weapons than the standard German infantry division. Formed around a small cadre of veteran troops and officers, the Volksgrenadier divisions were fleshed out with raw recruits, teenagers, and men considered too old or unfit for the regular army. Their main role was considered defensive. The 549th was led by Brig. Gen. Karl Jank. Brig. Gen. Walter Gorn led the 561st, and Brig. Gen. Ernst Meiners commanded the 547th. Gorn and Meiners had received the Knight’s Cross for bravery in battle. The other unit in Preiss’s corps was Maj. Gen. Friedrich Weber’s 130th Infantry Division, which had been badly mauled during the summer but had received some replacements from the recently disbanded 196th Infantry Division. As the battle progressed, both of these corps would be reinforced, and the units would be traded back and forth as needed. Hans Schittnig had only recently taken command of the 1st Division. He was just getting to know the division, and he made almost daily visits to the front, talking to his regimental, battalion, and company commanders and getting their input on what their opponents might be planning. On his first visit, he was appalled by the inadequacy of the positions that his troops were expected to defend. The division had a 20-kilometer front in the Schirwindt area just inside the border. The town itself was located about 55 kilometers northeast of Gumbinnen. As the division pulled into the sector, enemy probing patrols and harassing artillery fire made it clear that the Russians knew of its arrival. The increased enemy activity left little doubt that the sector was in danger of an impending attack, and Schittnig’s men worked around the clock to improve the almost nonexistent positions. Aided by two corps engineer battalions, they managed to build a frontline barrier as well as a secondary line about three kilometers behind the first. Rear area troops begin building more positions behind the first two in order to have fallback points to give the division a fighting chance. Work went on in other sectors of the front as well. Hossbach and his corps commanders knew that time was running out, and the old axiom that “sweat saves blood” was repeated again and again as the veterans and new recruits worked together before the Soviet attack. It would help, but most of the positions along the front were still inadequate to stop the initial assault that Cherniakhovskii had planned. On the Soviet side, the men had been bombarded with propaganda. The Germans had occupied Mother Russia for three years, committing many atrocities against soldiers and civilians alike. The men of the Red Army had paid for the liberation of their country in blood, taking millions of casualties. It was now time for revenge. 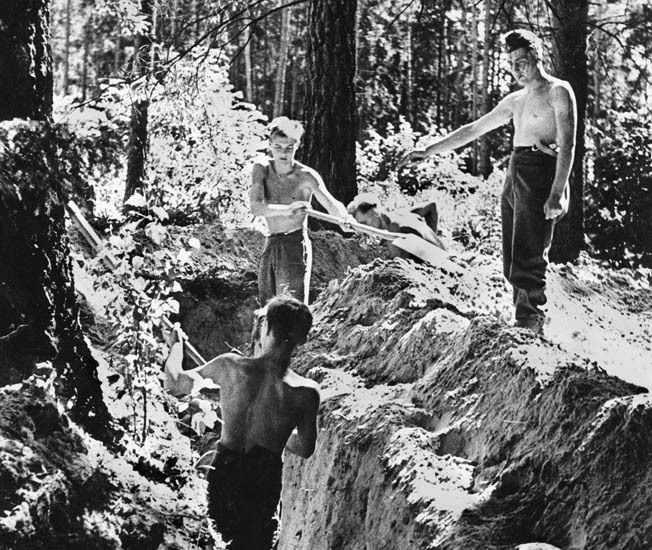 Young men of the German RAD, or Reich Labor Service, dig fortifications in a wooded area of East Prussia during the summer of 1944. The Germans knew that East Prussia would be a likely location for a Soviet Red Army offensive into German territory and tried to prepare for the coming onslaught. Ehrenberg’s diatribes were not just directed against the German soldier. His message to the Red Army soldiers, heard over and over again, called for retaliation against the German people as a whole. With those words ringing in their ears, Cherniakhovskii’s men prepared themselves for battle. They were ready for vengeance, and the civilian population of East Prussia would be the first to feel their wrath. In Hitler’s headquarters there was denial. The Führer could not bring himself to believe that East Prussia faced disaster. He refused repeated requests from Hossbach to turn the province into an operations zone. Such a move would put East Prussia under the control of the Army, usurping the power of Gauleiter Erich Koch, who had been in the position since 1928. A fanatical Nazi, Koch had joined the party in 1922 with membership number 90. Ever since Hitler had come to power, he was charged with controlling every aspect of civilian life in the province. If Hossbach’s request were granted, he would be able to order the evacuation of civilians in potential combat areas. The Army could also use the Nazi Party apparatus to help prepare defenses, which had so far been left to Koch, whose preparations were more of a hindrance than having any military value. Hitler steadfastly refused the notion—a move that would cost tens of thousands of civilian lives through May 1945. German reconnaissance units had been active during the first half of October. On October 14, after receiving intelligence reports and aerial photographs, Hossbach judged that he had only a day or two before the Russians unleashed hell. As his troops filed into their forward positions there was an uneasy calm in the air. October 15 passed slowly, with the men still working on strengthening their positions before falling asleep—the sounds of insects echoing through the swamps and forests. The calm was shattered at 4 am on the 16th, when hundreds of Soviet artillery pieces opened fire. A three- to four-hour bombardment hit the German front, raining a hail of iron and explosives on the enemy positions. The intensity of the bombardment and accompanying bombing from the air shocked the German defenders. Such firepower had rarely been seen on the Eastern Front. Men were buried alive as trenches collapsed or were blown apart by the heavy mortar shells fired by corps and army artillery units. Frantic calls for help were cut short as communication lines were blown apart and eardrums were shattered by the force of the concussions from heavy shells. As the bombardment moved to the rearward German positions, the troops of Luchinskii’s 28th Army advanced on Matzky’s corps. They expected to find only corpses and dazed survivors of the bombardment and the shattered remains of the German defenses, but they received an entirely different experience. Rising from the rubble, the soldiers of the 1st and 56th Infantry Divisions greeted the advancing Soviets with a withering fire. As the bombardment passed on, men struggled to right machine guns and mortars, while others dug up buried comrades. Two-man details were also sent to repair a damaged radio line that had been cut, and as more men were put back into action the divisional and corps artillery battalions, guided by surviving forward observers, brought down a wall of fire on the advancing Red Army. 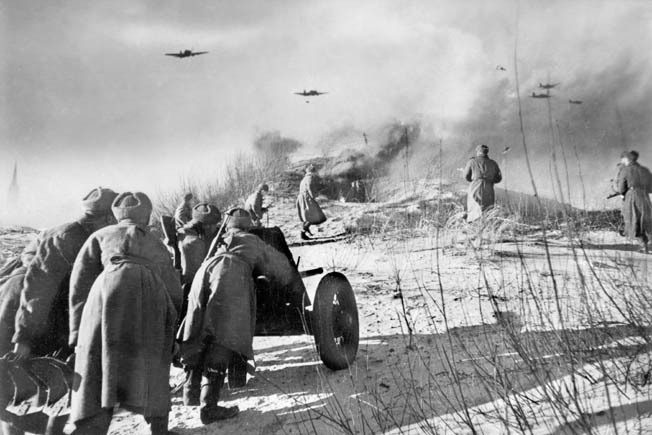 Advancing near the border of East Prussia, Red Army soldiers launch a probing attack against nearby German positions. The infantry support machine guns were often mounted on wheeled carriages, and these are prominently visible as the troops rush across a farmyard in September 1944. Losses in front of Schittnig’s division were particularly heavy. Five rifle divisions, supported by the 516th Armored Regiment, sought to break the East Prussians, but attack after attack was beaten off. Tank hunter squads roamed the front, cautiously creeping up on Soviet tanks that had outrun the infantry and destroying them with “sticky mines,” which were attached to the tracks or rear of the armored vehicle. Many of these men were killed before they could accomplish their missions, but enough succeeded to make the Soviets pause. Luchinskii ordered the self-propelled guns of the 122nd and 881st Assault Gun Regiments forward. Reaching the front, the guns opened fire point blank, targeting several German strongpoints. They were answered by the 75mm antitank guns of Panzer-Jäger-Abteilung 1. Those guns that had survived the earlier shelling opened up from their concealed positions, hitting several Soviet vehicles and forcing the rest to withdraw. Luchinskii was undeterred, and he ordered more units into the battle. Calling upon his last reserves, Schittnig succeeded in preventing a decisive breakthrough and ordered his troops to retreat in hedgehog fashion. The Soviets had received a bloody nose in his sector, but the 1st had also paid the price with casualties on the front line reaching 10 to 12 percent. With survivors making it back to the secondary line, the 1st Division prepared for another onslaught. To the south, Galitskii’s 11th Guards Army slammed into Jank’s 549th Volksgrenadier Division, which was supported by elements of Maj. Gen. Hans Bergan’s 390th Sicherungs Division (Security Division or SD). Bergan’s men were lightly armed, and although their primary purpose was to control rear areas of the army, they suddenly found themselves in the thick of the fighting. The division itself was a hodgepodge of units that included a regimental security group, four companies from the divisional war school, engineer and signals companies, and a replacement battalion among its formations. To Jank’s right, Corn’s 561st Volksgrenadier Division also came under heavy attack. With the help of Sturmgeschütz (assault gun) Brigade 276, commanded by Captain Axel Sewero, the Russian assault was slowed, allowing the Germans to retreat toward Ebenrode and the Pissa River. Some Soviets managed to infiltrate the thin German defenses and had worked their way into the rear areas. In one incident, 1st Lt. Friedrich Stück, commanding Sewero’s 3rd Company, stopped his unit in front of a vast cornfield. The Soviets, panicked by the fire from the assault guns, retreated. Stück ordered his company to continue firing, cutting down dozens of Russian soldiers. His accompanying infantry joined in as the assault guns advanced. Dozens more of the enemy perished before some made it to the safety of nearby woods, but it was clear that they had been totally disorganized by the attack as they disappeared among the trees. While soldiers at the front struggled to hold a cohesive line, the Red Air Force struck German supply lines in the rear. The town of Gumbinnen felt the full fury of the Soviet airmen as fighter bombers smashed the rail line that ran through it. A follow-up by medium bombers caused more damage, almost destroying the entire town. Frustrated by the first day’s action, Cherniakhovskii urged his generals to make better progress, and October 17 opened with another massive bombardment. The East Prussians of Schittnig’s division, which occupied positions in and around Schirwindt, were once again the object of Luidinikov’s 39th Army. The 1st Division stopped the initial attack of the day dead in its tracks. Luidinikov then sent armor and infantry to outflank the town from the north and south. Once again the antitank guns of Pz. Jag. Abt. 1 destroyed several Soviet tanks, but the move was effective. The Russians were able to enter the town, and the battle deteriorated into house-to-house fighting. By evening, the Germans had evacuated the town, leaving many of Schirwindt’s 1,000 inhabitants dead in the streets. The Red Army offensive into East Prussia in the autumn of 1944 was a harbinger of the death and destruction that were to come for German military personnel and civilians alike. Meanwhile, Galitskii was making decent progress against the hard-pressed 549th Volksgrenadier Division. After taking the village of Wirballen, about eight kilometers east of Ebenrode, the Soviets advanced another three kilometers and attacked Edytkau. Jank’s grenadiers fought for every house, but the enemy numbers were too great. Abandoning the town, the 549th made a fighting withdrawal to Ebenrode, where it prepared to make a final stand to protect the highway leading to Königsberg. As they approached Ebenrode, the grenadiers found a welcome sight. A battalion of the 103rd Panzer Brigade, commanded by Maj. Gen. Werner Mummert, met them on the road. Mummert’s tanks were supported by a panzergrenadier battalion, which immediately formed a defensive line in front of the town. As the Soviets approached, the combined infantry and tank fire demolished the advance units of Galitskii’s army, forcing the Soviet general to halt the attack. With his main avenue of attack blocked, Galitskii ordered the bulk of his army to move south and then head west, threading its way through an extremely marshy area filled with several small streams. It was a risky move, especially for his armored units. Once through the marsh, the Russians would be greeted with a landscape marked by hills and valleys, which would hinder reconnaissance. Nevertheless, with the unexpectedly strong German defense in the north both Cherniakhovskii and Galitskii agreed that the main effort of the assault should be switched to the southern portion of the 3rd Belorussian Front. The assault on the 17th finally shocked local Nazi Party leaders into action. The Kreisleiter (district leader) of the Schlossberg District, where Schirwindt was located, belatedly issued an order for the civilian evacuation of the district, too late for many civilians who had been caught up in the fighting. Farther south, the Kreisleiter of the Goldap District issued similar orders to his people after Glagolev’s 31st Army had forced Brig. Gen. Siegfried Hass’s 170th Infantry Division and Brig. Gen. Werner Schultz’s 131st Infantry Division to retreat. Panicked men, women, and children took flight with only what they could carry, and horse-drawn wagons clogged the roads, hampering the movement of reinforcements to the front. The resulting chaos, which could have been prevented if Hossbach’s earlier request had been granted, worked in favor of the Russians. During breaks in the clouds, Soviet fighters swooped down, strafing the columns and causing more panic as the refugees fled westward. By the morning of October 18, Galitskii’s troops, having made it through the marsh, were assembled near the village of Schlossbach. Under an umbrella of Red Air Force fighters and bombers, the 11th Guards Army moved forward. While the Russian forces left at Ehrenrode attacked German forces there, the bulk of the army moved westward, outflanking the Ebenrode defenses and continuing on to the Rominte River. At the town of Grosswatersdorf, about 25 kilometers southwest of Ebenrode, Galitskii’s forces crossed the Rominte and reached relatively open ground. From there, the 11th Guards Army pushed north and west on the plain between the Rominte and Angerapp Rivers. Hearing news of Galitskii’s action, Hitler issued an order to mobilize the Volkssturm, which was composed of boys and men who were so far considered unfit for military service, even in the Volksgrenadier divisions. Members of the units ranged in age from their early teens to well into their 60s. For the most part, Volkssturm units were not well trained and were armed with various weapons that included both German and captured enemy guns. Like their Volksgrenadier counterparts, they relied on light machine guns and Panzerfaust antitank weapons to stop the enemy. Volkssturm battalions were usually commanded by elderly or crippled reserve officers or by Nazi Party hacks. To make it worse, Gauleiter Koch insisted that the party remain in control of the units. This usually led to a total breakdown in communications with Wehrmacht forces, which resulted in neither force knowing what the other was doing or where they were. In the west, the Volkssturm usually melted away at the first sign of approaching Allied troops. In the east, however, many Volkssturm units fought bravely trying to stop the encroachment of the Red Army on their homeland. Like the East Prussian units of the regular army, they were fighting for their families and their homes. Supported by heavy self-propelled assault guns, Soviet soldiers advance rapidly toward the west and German territory in East Prussia. As Galitskii’s units advanced, Cherniakovskii ordered Luchinskii’s 28th Army to begin redeploying to the south to aid Glagolev’s 31st Army in its advance across the Rominte Heath. This left Krylov’s 5th Army to continue pounding Matzky’s northern front. As the Russians redeployed, Hossbach rushed to bring reinforcements to hold his flanks. The recently formed Hermann Göring (HG) Parachute-Panzer Corps, consisting of the 1st HG Parachute-Panzer Division (Colonel Hans-Horst von Necker) and the 2nd HG Parachute-Panzergrenadier Division (Colonel Erich Walther), came in from the north. Colonel Rolf Lippert’s 5th Panzer Division also arrived on the northern flank. Major Werner Freiherr von Beschwitz’s Schwere Panzer Abteiling (Heavy Tank Detachment) 505, which already had elements fighting in the area, was also being readied for a possible counterattack. In the south, elements of Colonel Hans-Joachim Kahler’s Führer-Grenadier Brigade (FGB) was arriving piecemeal. The FGB had been formed in the summer, and although well led, its troops were largely inexperienced. While the 1st Infantry Division held strong in the north, the combined forces of Galitskii and Glagolev continued to push the Germans back in the south on the 19th. Although the Soviets were advancing, they were paying a price in men and equipment. Defending the villages of Alexbrück and Goriten southeast of Ebenrode, the Tiger tanks of von Beschwitz’s heavy tank detachment knocked out seven Russian tanks before retreating to avoid being outflanked. The Germans were trading land for time, allowing the Soviets to edge westward and exposing their flanks for a counterattack. The ferocity of the defense was costly for the Germans as well. Captain Gerhard Hoppe, commander of Sturmgeschutz Brigade 279, was killed. His replacement, Captain Hans-Joachim Heise, was badly wounded in fighting on the northern edge of the Rominte Heath. His place was taken by 1st Lt. Gerhard Stahlhacke, who continued the fighting withdrawal. On October 20, the Soviet assault continued unabated. A local attack on Galitskii’s right flank was launched by the HG Panzer Corps and von Beschwitz’s 505th. Von Beschwitz’s unit claimed four tanks and 26 antitank guns destroyed. The attack drove the Russians farther south, but the Soviets strengthened their flank with more antitank units and continued to advance toward the Angerapp and the river crossing at the village of Nemmersdorf. While Galitskii fanned out to the north and west, Luchinskii’s 28th Army was advancing on Goldap. Much of the town’s population of 13,000 was already on its way out of the town, but many civilians remained. Schulz’s 131st Infantry Division, holding positions east of the town, was successfully parrying Soviet attacks. He was supported by the 400-man strong Goldap Volkssturm Battalion. When the battalion was formed, Schulz immediately put it under his command, refusing to accept party authority over the unit. Since then it had been holding a defensive position between two of Schulz’s battalions and had proven itself in combat. Regeniter had better luck that evening. A burning T-34 revealed an IS II lurking in the darkness. After firing four rounds with no effect, his fifth shot managed to pierce the giant, which blew up a couple of minutes later. By the end of the day, the Soviets had pushed even farther westward. Cherniakhovskii, frustrated by the continued German resistance, had released his reserves, Burdeinei’s 2nd Guards Tank Corps, prematurely. Moving quickly, Burdeinei’s 25th Guards Tank Brigade and 4th Guards Mechanized Assault Brigade swept toward the Angerapp River and took the crossing at Nemmersdorf. After occupying Nemmersdorf the Soviets set up defensive positions on the western edge of the village. The Russian spearhead was now less than 80 kilometers from Hitler’s headquarters at Rastenburg. Some of Hitler’s aides urged him to evacuate the headquarters, but he refused. He was worried about the effect on the morale of the troops if it appeared that he had abandoned them. The mulitated corpses of women and children lie gathered for burial in the East Prussian town of Metgethen. Soviet troops were encouraged to exact revenge and retribution for the atrocities suffered in the months that followed the German invasion of the Soviet Union in the summer of 1941. Cherniakhovskii now found himself in a rather precarious position. Galitskii had made the farthest advance, but his flanks were exposed until the neighboring armies overcame resistance in their sectors. In the Schlossberg area the 1st Infantry Division still resisted all efforts from the 5th Army to break its line. Farther south, the line ran across Ebenrode to Gumbinnen. That line had been strengthened by the HG Panzer Division and Lippert’s 5th Panzer. The arrival of Brig. Gen. Günther Sachs’s 18th Flak Division added a deadly array of antiaircraft guns, including the renowned 88mm, which were also used in an artillery and antitank capacity, to combat the Russians. Fighting near Gumbinnen and Trakehnen was particularly fierce. Elements of the HG Corps were forced to give way—a move that threatened Trakehnen. As the infantry retreated, it ran into panzers from the HG Panzer Division, which had been sent to reinforce the sector. A swift counterattack pushed the Soviets out of their newly captured positions and restored the line. Heavy attacks at Gumbinnen were repulsed by reinforcements from the 5th Panzer Division. In a series of sharp engagements the Russians sustained substantial casualties. German losses were also severe and included the commander of the XXVII Army Corps, General Preiss, who was killed in action about five kilometers southwest of Gumbinnen near the village of Hasenrode. His replacement, Maj. Gen. Maximillian Felzmann, arrived five days later to take command. To Galitskiis’s south, the 31st and 28th Armies were clawing their way toward Goldap. The hard-pressed 131st and 170th Infantry Divisions bore the brunt of the attack. A Soviet armored column managed to break through the 131st’s line, but disaster was averted by the timely arrival of Sturmgeschutz Brigade 179, which destroyed several Russian tanks and forced the rest to retreat. A second breakthrough met the same fate. Goldap itself would fall the next day when the 170th was forced out of its positions within the town. Late on the evening of October 21, Hossbach ordered a counterattack. He planned to use the 5th Panzer, with von Beschwitz’s 505th attached, to attack from the north and link up with the FGB, which would advance from the south. If all went well Galitskii’s forward elements would be cut off from the main part of the army and be destroyed. German units covering the flanks could then move forward and establish a shorter defensive line on the main front. The assault units moved into their jump-off positions during the early hours of the 22nd. After a short artillery barrage, the Germans moved forward. The Soviets, caught off guard, put up heavy resistance in some sectors and abandoned others without much of a fight. Von Beschwitz’s detachment recaptured the village of Grünfliess, five kilometers southwest of Trakenhnen, and continued to roll forward with the 5th Panzer Division. “The enemy pulled back and we occupied the village in the early morning fog. Our infantry provided security in the direction of the enemy. We crushed three light antitank guns under our tracks and took a 76.2mm ‘Ratschbum’ [German nickname for the Soviet antitank gun that made a distinctive sound as it fired] in tow.” Regeniter had already knocked out five enemy tanks during the first hours of the attack. In the Daken sector the FGB was fighting off vicious counterattacks as the men pushed forward toward their objective—Grosswaltersdorf. In Daken itself a panzergrenadier battalion, supported by one Panther medium tank, held out against mixed tank and infantry attacks. By the end of the day, advance elements of the FGB had reached Tellrode, about one kilometer south of Grosswaltersdorf, but the main objective was still in Soviet hands. Around Nemmersdorf a variety of Volkssturm and ad hoc units had formed a defensive line around the small Soviet bridgehead. Günter Koschorrek was a member of one such unit. Recovering from wounds received two months earlier in Galicia, he had been put in charge of a group of men training to become panzergrenadiers. When Cherniakovskii opened his offensive, Koschorrek and his men formed up and were trucked eastward. With the attack near Grosswaltersdorff going well, Koschorrek’s unit and others were ordered to attack the enemy positions to their front. Casualties were initially high as Soviet machine guns swept the field, but the Germans pressed on, taking forward enemy positions and reaching the outskirts of Nemmersdorff. There, they found out what total war meant. “When we moved through the village, we found no more Soviets,” Koschorrek recalled. “But we were greeted by grisly scenes of the people that had been caught up there, which reminded me of the atrocities suffered by Soviet villagers from their own soldiers, something I had often seen during our retreats early in 1944. Here were German women, whose clothing had been torn from their bodies so that they could be violated and finally mutilated in horrific ways. A Volkssturm member named Karl Potrek described finding “four naked women who had been strangled behind a cart.” He estimated that there were about 70 civilian bodies, all but one being women and children. 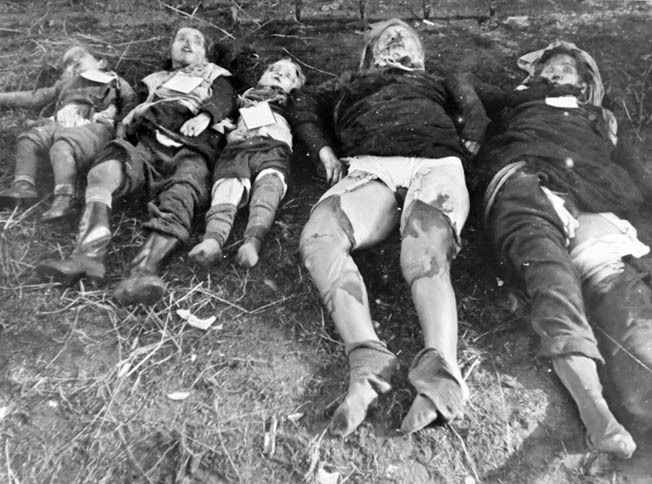 About eight kilometers to the southeast in the village of Schulzenwalde, about 95 more bodies were found. He was right on that point. However powerful Ehrenberg’s words were, many of the average Red Army soldiers had already witnessed or heard about the atrocities perpetuated by German forces on the Soviet people. There were few rules of war on the Eastern Front, and the slaughter of German civilians caught up in the chaos of war was payback for three years of terror that people living under the German occupation had suffered. In October 1944, German civilian residents of an East Prussian town are undergoing training for the Volkssturm, units composed of old men and boys who offered a last line of defense against the marauding Red Army. These ill-prepared men are thus far without uniforms and fielding antiquated weapons. 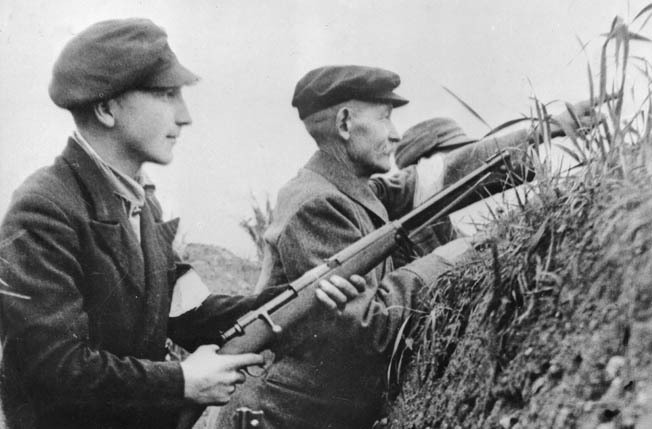 The young man in the foreground is holding a Carcano Mod. 91. The northern and southern German pincers met on October 23, establishing a tenuous defensive line that faced both east and west. A battle group of the 5th Panzer Division under Captain Alfred Jaedtke, commander of the I/Pz. Gr. Rgt.14, set out to the west to take on the Soviet units that had been cut off. Jaedtke hoped that those Russian units would be crushed between his battle group and the forces that were attacking from the west. Russian pressure at Daken had finally forced the Germans out of the town. The battalion holding it retreated and set up a new defensive line. Meanwhile, elements of the HG Panzer Division were moving to the area to reinforce the FGB. The commander of the I/HG Pz. Rgt., Captain Joachim Renz, was killed as his battalion engaged the enemy. Undeterred, 1st Lt. Gerhard Tschierschwitz, commanding the battalion’s 2nd Company, moved forward with his men and pushed the enemy out of Wirballen. Lacking infantry support, he continued the advance to the village of Jägershagen, seven kilometers southwest of Trakehnen. In the village he found an enemy command post and assembly area. The ensuing engagement netted the 2nd Company 16 destroyed Russian tanks, 16 antitank guns, six artillery pieces, and 13 machine guns. Tschierschwitz’a panzers also destroyed the command post and killed almost 300 Russians. Although Galitskii’s spearhead had been blunted, Cherniakhovskii had no intention of admitting defeat. He ordered his armies to continue the attack, knowing that the Germans had suffered considerable casualties that could not easily be made up. On the German side, it was a matter of thrust and parry as the weakened units tried to keep their line intact. Von Beschwitz’s heavy panzer detachment and the 5th Panzer’s II/Pz. Gr. Rgt. 14 attacked Grosswaltersdorf on October 24. Russian forces, dug in on the western outskirts of the town, threw up a wall of fire as the Germans advanced. It was too much for the Germans, who were forced to retreat. Fighting renewed along the front the following day with neither side making much headway. Both were realigning their forces, hoping to outguess their opponent and exploit any weaknesses. One of the few successes of the day occurred when Galitskii took Ebenrode on the night of the 25th, which threatened the flanks of German units defending the highway to Königsberg. 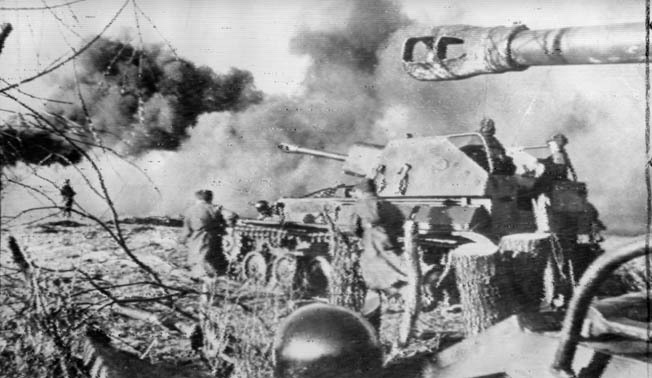 On October 26, a powerful Red Army combined force, including 50 tanks, broke through a sector of the HG Panzer Division’s defensive line in the Trakehnen area. The commander of the 1st Company of the German division’s anti-tank battalion, 1st Lt. Karl-Heinz Wallhäusser, launched an immediate counterattack. Collecting stragglers along the way for infantry support, Wallhäusser’s self-propelled antitank guns struck the Russian flank, destroying a number of tanks and heavy weapons and driving the remainder back to their start line. Soviet soldiers streaming through an East Prussian village during the followup Red Army offensive in early 1945. Within months, the Nazi capital of Berlin was in Soviet hands and World War II in Europe was over. In another sector, Private Albert Plapper, leading the 4th Company of HG’s Pz. Gr. Rgt. 2, took over a machine gun that had been put out of action and stalled a Russian infantry attack. The Soviets called up tank support. As they approached, the 18-year-old Plapper destroyed five of them with a Panzerschreck hand-held reloadable 88mm antitank weapon. He then led a counterattack that threw the Russians back and restored the line. At Grünweiden, about 4½ kilometers northeast of Grosswaltersdorf, a Soviet attack also broke through the German line. Four of von Beschwitz’s Tigers were sent to the village of Weidengrund, about two kilometers to the northeast. There they engaged the point of the Russian attack, sending the enemy tanks and infantry reeling. Bringing up reinforcements, the Russians attacked en masse, pushing the Tigers back. The situation was saved by the timely arrival of some Panthers and assault guns, which launched a counterattack that broke the Soviet assault. Nine Soviet tanks and four antitank guns were destroyed in the operation. Fighting continued the following day with the same give and take. On the 28th, Schittnig’s 1st Infantry came under another massive attack. In the previous 12 days, the 1st had been pushed back about 25 kilometers, but it still hung onto Schlossburg. The division had also destroyed about 130 tanks and assault guns as it fought to hold off the Russians. The preliminary bombardment was huge, and parts of three Soviet armies took part in the assault, but Schittnig’s men held. Small reserve forces were formed from the declining numbers of the division and were rushed to any area that was in danger of a breakthrough. By keeping his reserves moving up and down the line, Schittnig was able to stop the Russians as they attempted to break his defenses. As the situation settled down once again, Hossbach moved to smash the Soviet salient around Goldap that threatened the valley between the Rominte and Angerapp Rivers. He called on Maj. Gen. Karl Decker, commander of the XXXIX Panzer Corps, which had transferred from the Third Panzer Army, to make the attack. The assault called for a two-pronged attack. From the north, Lippert’s 5th Panzer (which Decker had previously commanded), supported by the FGB’s panzergrenadier battalion, would make a thrust toward Goldap. In the south, Haus’s 50th Infantry, supported by the FGB’s Panzer-Fusilier Battalion, would move to link up with the northern force. All of the units set for the attack had been weakened by the previous fighting. For example, the monthly condition report of the 5th Panzer showed a total of only 21 Panthers and 12 Panzer IV tanks fit for operations on November 1. During the night of November 2, the two forces moved into their jump-off points. There, they waited in darkness in the snow-covered terrain. As midnight approached, officers and NCOs went through the plan of attack one more time with their men. The movement to their new positions seemed to have gone unnoticed by the Soviets, and all was quiet on the enemy side of the line, so the chances of surprise seemed good. Overcoming the Soviet defenders, the 5th Panzer and FGB grenadiers continued to advance, reaching Lake Goldap. By dawn they were only two kilometers from Goldap itself. To the south, Haus’s 50th Infantry and the FGB fusiliers fell upon the unsuspecting Russians with a fury. Quickly overrunning trenches, the Germans pressed forward. Along the way they destroyed 42 Soviet tanks. They made contact with the northern force and then established defensive positions east of the town. The combined elements of Decker’s force now moved to take Goldap while fighting off Soviet attacks intended to relieve the encircled town. Casualties mounted during the back and forth struggle, but Decker’s force held off repeated enemy assaults. Decker’s attack finally succeeded when the Soviets inside Goldap were eliminated on November 5, and German forces recaptured the shattered town. Looking at the shattered buildings, they knew that this would be the fate of all of East Prussia if the Soviets ever took over the province. They were right. Cherniakhovskii’s assault did not lead to the capture of Königsberg. The Germans reestablished a solid front and fought 40 Soviet divisions to a standstill, although the Russians now retained a 40-kilometer-deep and 150-kilometer-wide foothold within the Reich. With both sides exhausted and winter setting in, only minor actions took place for the remainder of November. The Soviets had learned that even the weakened enemy divisions, such as the 1st Infantry Division, could stand up against sustained attacks now that they were defending their homeland, and the breathing space in November was used to replace losses and bring new forces into the area as about 79,500 Soviet soldiers of the 337,000 committed to the Goldap Operation had become casualties. When the red storm broke over East Prussia on January 12, 1945, it would truly mean the end of the Third Reich and of East Prussia itself. The drive would take the Soviets in the north through East Prussia and down the Baltic coast into the eastern part of Germany. At war’s end the province of East Prussia was divided between the Soviet Union and Poland, with almost all of the German population that had not been killed expelled to the west. The seat of German militarism was no more. Tags Adolf Hitler, Allies, Axis, Battle of Kursk, Battle of Tannenberg, Battle of the Masurian Lakes, Eastern Front, friedrich hossbach, Goldap-Gumbinnen Operation, Hermann Göring, ivan cherniakhovskii, Joseph Stalin Tank, Königsberg, leningrad, Nazi Germany, Red Army, Smolensk, wehrmacht.